With the rise of employer reputation sites like Glassdoor, overwhelming dread has overcome HR and senior leadership -- a feeling of Glassdoor Angst. Anonymous reviewers are publicly posting "insider information" outside of management’s control. In 2014, most CEOs we spoke with didn’t seem to know or care about Glassdoor. But now more than half of the CEOs we speak with mention their Glassdoor reviews in our first meeting. Employers are wise to be concerned about these bad reviews. Glassdoor is now bigger than CareerBuilder, and with all those visitors, it's the fastest-growing career site. Everyone worries about the effect of Glassdoor reviews on their recruiting efforts -- wondering especially if poor reviews take a toll on job advertising response rates. When a job ad performs poorly, is it because of Glassdoor or something else? As the competition for good people intensifies, employers fear anything that will have top candidates ignore their job postings, in favor of applying elsewhere. Employers are right to be worried about Glassdoor, but their fears are misplaced. 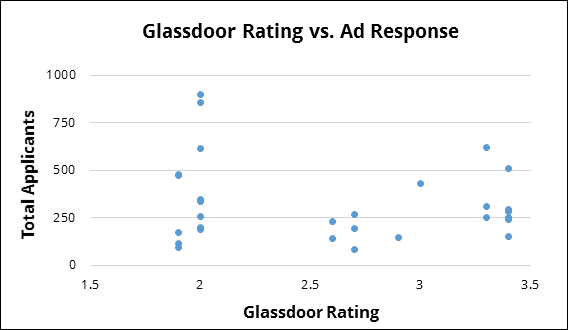 If you don't see any correlation, you're right -- bad Glassdoor scores had a negligible effect on advertising response rates. Some of the lowest rated organizations received the most applications, while some of the highest rated organizations ranked among the fewest applications. So poor Glassdoor reviews don’t cause poor advertising response rates. But left unmanaged, they are still a ticking time bomb for your recruiting efforts. The problem just comes later in the hiring process -- more candidates are likely to opt out of a second interview, and more top candidates are likely to decline your job offers.